All candidates looking forward to Jobs in Police Department 2019, kindly pay attention. Here we give you chances to know all those opportunities that give you chances to apply for best Upcoming Police Recruitment. The Police Recruitment is usually controlled by the government of India at different levels. Broadly there are classifications for CRPF Police Vacancy and the state law enforcing units. However, the candidates aspiring for these police jobs looks after the government of India. 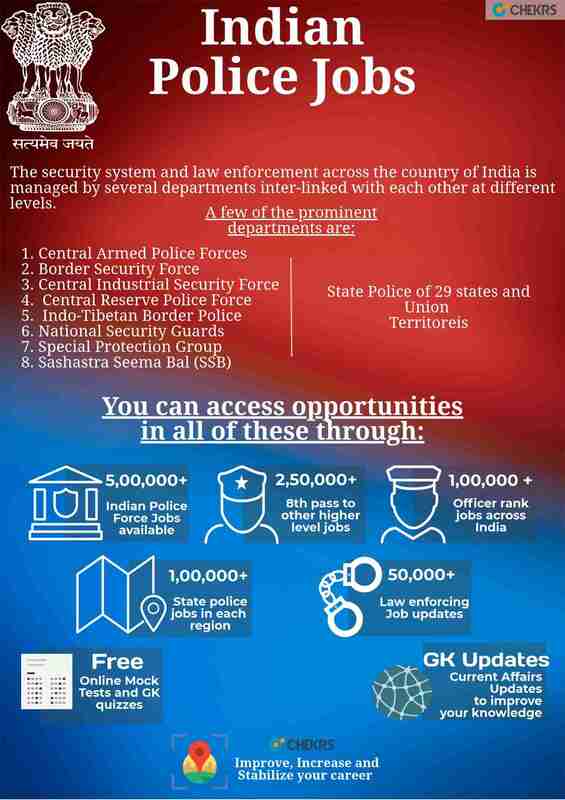 The candidates possessing the interest in the field can get to know Government Police Jobs 2019 released in all of these departments. Our team exerts efforts on your behalf and provides you with the best possible solution. Furthermore to help you make your website easier through subscription you can easily get Latest Police Jobs 2019. We believe in keeping our readers well informed with the Police Vacancy that grabs their interest. To facilitate you with options we have used filters for the same. Regardless of whichever region you belong from, you to apply only for jobs meeting your priority to get Police Jobs in Rajasthan, Telangana, AP, UP, Punjab, etc. Along with it, you can even view Police Jobs for 8th Pass, 10th Pass, Women, Graduates, B.Tech, etc. Why Chekrs for Police Jobs Vacancy? While implementing the idea to provide jobs we add resources that can deliver a 100% success rate to the candidates. Through Chekrs you can even access the study material that can be used while preparing. You can easily download and use the previous papers, model papers, online free mock test, and the GK quiz. Police Jobs for 8th Pass, 10th Pass, Women, Graduates, B.Tech, Police Recruitment 2019, Police Bharti, Police Recruitment 2019, Jobs in Police Department 2019, CRPF Police Vacancy, Police Latest Jobs 2019, Police Job Notification, Police Jobs in Rajasthan, Telangana, AP, UP, Punjab.